Every dog lover knows there is only one acceptable response when you see a friend’s dog for the first time. You’re supposed to say, “Wow! That is the most gorgeous bulldog I’ve ever seen!” Clearly my friends had not gotten that memo because instead I was starting to hear, “Wow that dog is BIG.” And I could tell by the way they said BIG, they didn’t mean it in a good way. I don’t know about you, but when someone insults my dog, it kills me. I would rather hear them say that I’m starting to show my age or that my shirt is ugly, but please, PLEASE, whatever you do, don’t ever criticize my dog. I just can’t handle it. Did you catch that? I would never feed my dog chocolate. Like most pet owners, I’ve memorized the foods that are poisonous to dogs. But for some reason, I thought vanilla ice cream was fine. And even though vanilla ice cream wasn’t making my dog sick, it was definitely not an appropriate dog treat. Human food and table scraps seem harmless enough, but they can lead to serious problems in bulldogs. I consider myself a good dog owner. In fact, I consider myself a GREAT dog owner. 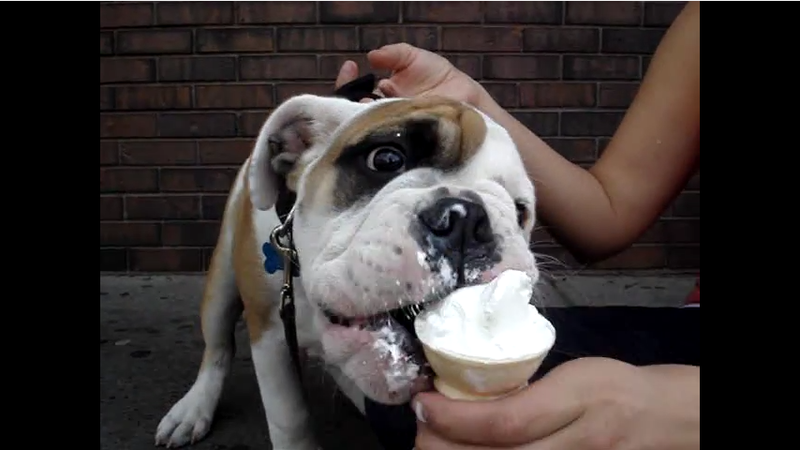 But I just couldn’t help myself when it came to feeding my bully ice cream. When she would see me get out the ice cream scoop, she would jump up and run to the kitchen! She shared my love of ice cream, and I shared my ice cream with her. It had become a nightly ritual, and she had developed a weight problem. Let this serve as a cautionary tale to all bully owners. 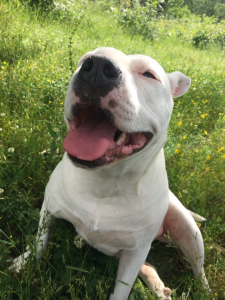 Nobody wants to put his dog on a diet, and it’s a lot easier to prevent weight gain than it is for your bully to shed excess pounds. Unfortunately, bulldogs are more prone to weight issues than most breeds, so bulldog owners have to be especially diligent. Dogs develop weight problems for the same reasons that people do. In most cases it’s a combination of too much food and not enough exercise. Even though I faithfully exercised my bully every day, I wasn’t helping her to burn enough calories to make up for the nightly ice cream binge. My hurt pride wasn’t the only motivation to help my dog lose weight. I want her to live a long, healthy life, and excess weight could lead to a lot of other problems, including heart disease, joint problems, and diabetes. Another worry is that surgery is more complicated and riskier for fat dogs. As I resolved to be a better pet parent, I accepted that our late night treats had to end, and I made a game plan. I stocked up on low calorie dog treats and food, and I implemented portion control. Daily exercise continued, and I learned to show my love for her with a tummy scratch instead of ice cream. Initially, none of my techniques produced results. I was pleased that my dog didn’t seem to miss the ice cream, but I was discouraged that she wasn’t losing weight. I soon realized that we had another problem. My dog was helping herself to all my other dogs’ dinners. Her technique was impressive. She would subtly curl her lip, and if that didn’t cause the other dog to abandon his bowl, she would bulldoze him out of the way! Modifying the weight loss plan, I started separating her from the other dogs during feeding time, and finally… success! She gradually lost the excess weight, and I have been able to help her maintain her healthier physique with portion control, daily exercise, and feeding her alone. Oh yeah, and NO MORE ICE CREAM. I’ve noticed my girl is even more active now. Her weight gain had been so gradual that I hadn’t realized it was slowing her down. We now spend our evenings ice cream-free, and we don’t even miss it. Today we took a ride, and I ran into an old friend. Can you guess what he said when he saw my bulldog? “Wow! That is the most gorgeous bulldog I’ve ever seen!” And he was absolutely right.